January has brought more heat waves, but some relief also with storms and rain at both properties, enough to keep the grass green at least (100mm at Kumbia has also filled dams, a massive relief). The dogs have been helping with the house renovations and Gus has learnt to take himself for a swim and then nap in uncomfortable positions. Have you been following my weekly lunch updates on Instagram (summarised earlier in the week with recipes in a post)? I'll keep posting these and I encourage you to join in if you work or are away from home at lunch, you can save so much money by taking your own, and eat better too. We were very lucky to get 100mm of rain at Kumbia (and not as much at Nanango, storms are fickle like that). All of our small dams are full and our big one is about half full. While we were checking the big dam we sneaked up on a family of wild pigs - three mama pigs with piglets, they ran away when they saw us, however it is encouraging that pigs do well on our property as we are keen to keep our own pigs in the bush areas eventually. This time of year we usually have some chicks hatching, so its a bit sad not to have another brood of cuties to raise, but at the same time its nice not to have the responsibility this year. It is hard work when they get to that stage where they are too big for the brooder but not old enough to live outside, just messy and smelly and noisy teenagers, yuck. We had a long weekend with Australia Day on a Thursday and took the opportunity to separate the cows from the calves. This worked out well, as when I checked them again on the Friday one of the cows had managed to get through the fence to search for her baby. By Sunday they all seemed pretty happy grazing and had forgotten they had lost each other. We put Bella and Molly (the dairy cows) in with the calves to help them stay calmer. The bull is with the cows as the heifer calves are getting to the age where they can start to come on heat. I will be pleased to sell them in July (start of the next financial year). We caught another swarm at a friend's place and just missed catching another one (it was gone when we arrived). Swarming bees are relatively calm and its not too scary or difficult to catch the now that we've had some practice. As long as you get the queen in the box, the other bees will follow and usually the frames of beeswax make it smell like home and they decide to hand around. I didn't get around to my garden update post, I'll get to it this month. My herb garden needed a good trim, so I've been taking advantage of the heatwaves and drying lots of herbs. I like to have oregano and rosemary for cooking, and other herbs I dry for herbal teas. We have made some huge progress, with the floors now sanded and polished, the laundry floor tiled and everything ready for the cabinet maker to install the kitchen, spare bedroom wardrobe and laundry. We chose fabric for two couches and a "feature arm chair". 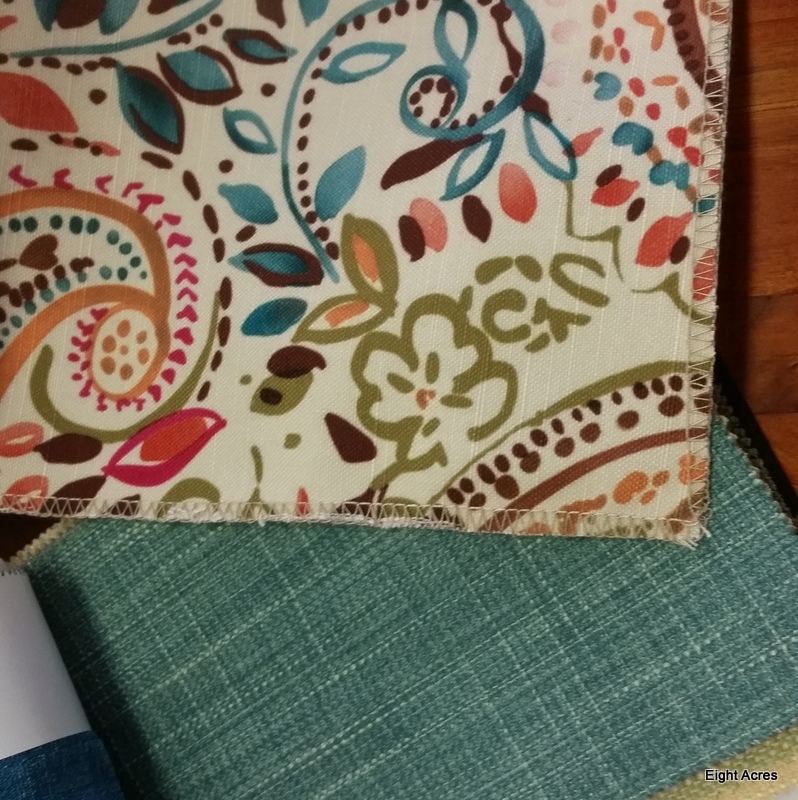 The teal below is the for the couches and paisley for the chair. I hope this will bring some colour to the house as the walls are beige. We have to wait a few months to find out as they are being custom made. Eggplants from a friend - these grew in a pile of horse manure while she was on holiday! 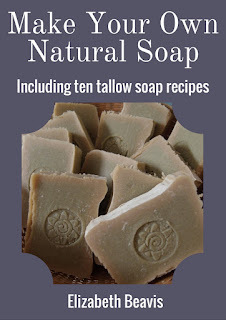 When I started selling my soap, my aim was to use up all the tallow from the beast that we had killed. I long-ago finished that tallow and I've been using tallow gifted by a friend who sells sides and quarters of beef to the public (look up Grass to Gill on Facebook if you're in Brisbane and surrounds and looking for quality beef, pork and lamb). But I ran out of that tallow too, and Pete had to take a trip to the local abattoir to keep me supplied. It was only 60c/kg, so I told him to get at least 20kg to make it worth the trip. And now we are rendering the fat and I'm making more soap! 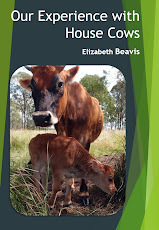 I got a late Christmas present from my blog readers, thanks everyone who has been clicking on my amazon links! I earned enough to purchase these two books and I'm reading the tree one at the moment, its fascinating, review coming soon! Also if you get my blog via email, you will notice that I have a new and improved format, I hope you like it and you can reply to the emails to let me know what you've been up to. How was your January? What do you have planned for February? You're so lucky to get such a huge dumping of rain. I'm in Sandy Creek, near Kilcoy, and we're in desperate need of something. Our dam is dry, and we're down to about half a tank with water in it, out of our 3 large tanks. Fingers crossed we get something soon, as I really don't want to buy any water in. Love to read your updates.